It was 23:52 at night when a regular customer sent me a text saying "disaster with my laptop, had to shut down quick then restarted Outlook will not open" as with most business people he is 100% reliant on email for communication. I fired up my laptop and made a remote connection via LogMeIn and quickly found the cause was a corrupted profile which I repaired so my customer was back working in about 15 minutes. Posted by Brian David Simonds. A customer who lives on a farm have converted a barn to a holiday let. Clients expected to have internet access while staying their but there were obstacles. A customer recently had 5 cameras and DVR installed on the understanding that they would be able to view them remotely on their mobile phones and via a web browser. However at then end of the install they were told that the installers could not make the necessary changes to the network to enable remote access. I was contacted and within a couple of hours they were able to view the cameras remotely via a phone app called TAPCMS as well as via a web browser. I have designed a new website www.gt-ecom.com for company GT eCommerce who provide cloud based software for online selling through marketplaces like Amazon and Ebay or on custom web stores. 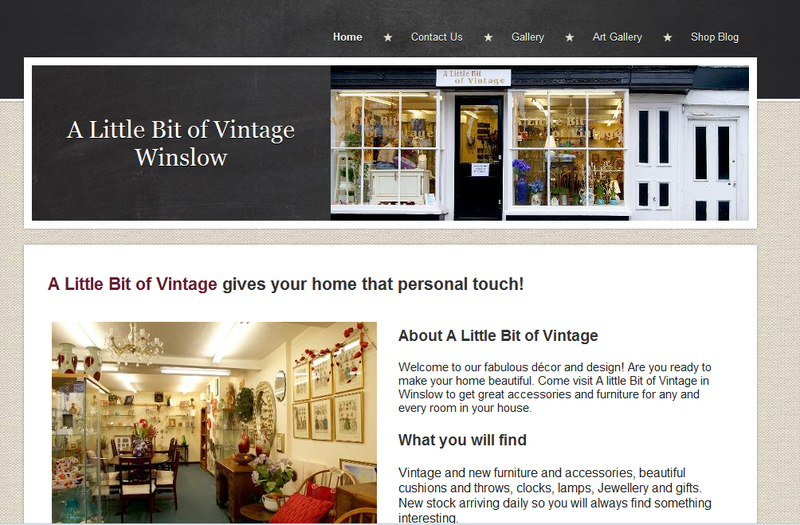 I just launched a new website for a shop in Winslow A Little Bit of Vinatge for which I did the photography as well as the web design. The shop sells furniture, home accessories, vintage style clocks, local art and jewellery is well worth a visit as they are getting new stock daily. If have some small items to sell also rent out glass pods in their busy shop so get in touch with Caroline or Dave.